A few years ago, San Antonio City Council member Rey Saldaña tried his own transportation experiment. He ditched his car and relied on public transit for one month. The good? Saldaña met great people. He read. He explored the city. Parking was no problem. The bad? When buses ran late, he missed connections and showed up late to council meetings. Rain drenched him at bus stops. He had to skip fun activities because of a lack of frequent routes. Saldaña’s eye-opening experiment led him to champion more funding for VIA Metropolitan Transit (VIA), the regional mass transit agency serving San Antonio and Bexar County, which operates with the least amount of funding among all major transit authorities in Texas. His efforts spurred the city to invest millions to improve public transportation, including a partnership and funding plan with the city approved by council on Sept. 13, 2018, to provide $4.3 million in general revenue funding to support VIA operations in FY18, and $10 million per year beginning in FY19. Saldaña, the City Council representative in District 4, a heavily Latino part of town, posted a date-night-selfie with his wife in front of a VIA bus stop on Facebook in 2015. Some people applauded the couple’s use of public transit. Waking up three hours early just to catch the bus. Missing a transfer and waiting 45 minutes or an hour for the next bus. Having to walk or bike to the nearest bus stop with no sidewalks and amid dangerous traffic. Spending hours waiting for and riding the bus, when a car would’ve been three times as quick. Waiting at bus stops at shelters with no seats or roofs. Saldaña accepted the challenge. He quit his car for one month. He recalls finding friendly operators and comfortable vehicles, but also discovered the inconveniences of having to ride the bus and the issues with navigating a system lacking frequency and routes. He wanted to bring the issue up to the entire City Council. So Saldaña started doing his homework. He read about transportation funding. He asked Jeff Arndt, President/CEO of VIA, and Hope Andrade, Chair of the VIA Board of Trustees, to educate him about the history, funding, and operations of the agency. He continued to seek stories of real people’s struggles to understand the challenges in all 10 council districts. Saldaña began to see just how deeply the city needed to improve public transit. The frequency sweet spot for buses is 10-12 minutes, frequent enough that people don’t need to look at routes schedule yet not so frequent that buses are empty or operating expenses skyrocket. In San Antonio, 83.8 % of survey respondents said they are interested in using transit if the frequency is 10 minutes or less. Interest decreases to 63.7 % for 11- to 20-minute frequency and drops to 21% for 20 to 30-minute frequency, according to research conducted on behalf of the Alamo Area Planning Organization (AAMPO). Yet nearly 75% of VIA buses were operating at 30- to 60-minute frequency, at their most frequent. Ridership within the region is only 3.3% and it’s no surprise that riders can become frustrated, or that people with other travel options use them. Why Aren’t VIA Buses More Frequent? VIA is underfunded compared with other major Texas cities. In 1977, voters approved a half-cent sales tax in San Antonio and seven incorporated municipalities to create and fund VIA. Operations began in 1978 and have continued with the same sales tax funding allotment for 40 years. In 2004 however, voters approved a quarter-cent sales tax to fund transportation improvement projects carried out by VIA, City of San Antonio, and the Texas Department of Transportation through the Advanced Transportation District (ATD). VIA receives half of the ATD revenues, which is an eighth-of-a-cent. In fiscal year 2017, local sales tax dedicated to transit added up to $175.1 million in San Antonio, which is less than the transit authorities in Houston ($690.9 million), Dallas ($567.4 million), and Austin ($228.5 million). When you compare tax revenue per capita and per square mile among the cities’ transit authorities, VIA comes in dead last. VIA received $117.35 in sales tax revenue per capita compared to Dallas Area Rapid Transit (DART) at $241.01, and $142,862 in tax revenue per square mile compared to DART at $810,597. Saldaña didn’t think this was acceptable for his council district, or for the 1.8 million people VIA serves across their 1,226-square mile service area. To improve service, VIA needed more funding. He began to raise awareness about VIA’s inadequate funding and champion reform in his community and at City Hall. San Antonio is one of the nation’s most economically segregated cities, with diabetes rates in some parts of the city as high as 20% and a 20-year gap in life expectancy in different ZIP Codes. Health and wellbeing are not just healthcare issues in these areas. They are community design issues. Our community influences our human experience; thus, impacts our educational attainment, income, and physical and mental health. Public policy determines how our communities are designed, primarily in the form of transportation and land use policies, and resource allocation. Consider quality and availability of schools, affordable childcare, healthy food, parks, healthcare, employment opportunities, and the streets, sidewalks and transit connecting people to these places. 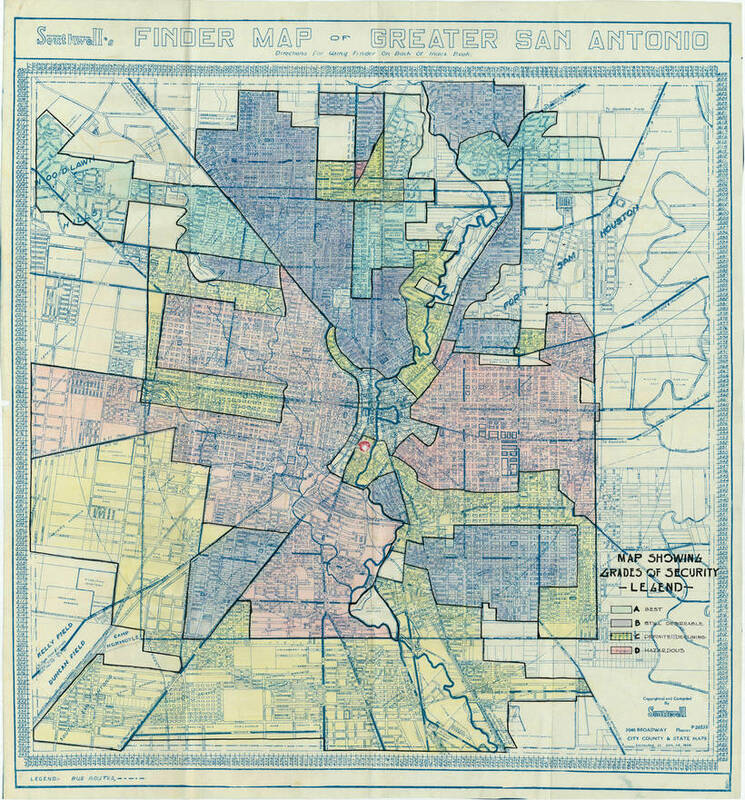 San Antonio, unfortunately, was not built with health, equity or sustainability in mind. This results in health inequity, high poverty rates—particularly among single mothers and seniors—and an expensive-to-maintain, auto-centric transportation system. “We have seen disinvestment in parts of our community that were redlined 80 years ago, or not even that long ago, that are now demanding attention and need to be invested in if we are really going to build equity in the basic services and infrastructure that the city provides,” San Antonio Mayor Ron Nirenberg told the Texas Observer. Residents responding to the Bexar County Community Health Needs Assessment reported that public transportation in the region is limited, making it difficult to get to work, access healthy food, make health appointments, and attend school events. Vulnerable populations are less likely to own a vehicle and more likely to be dependent on public transportation, which introduces additional barriers in San Antonio, according to the report. Low-income families are more reliant on walking for essential journeys than middle-class families. Yet low-cost housing is often located in the most car-dependent places. One resident told Saldaña that he had to spend 1.5 hours on the bus just to get to the only restaurant that was hiring. Another resident struggled to find an affordable apartment near his downtown job and had to settle on the northeast side, adding over an hour to his bus commute. Some people spent three to four hours on public transit every day. “I want to give them that time back,” Saldaña said. Public transportation also plays an important role in the regional economy. To reduce health inequities, economic segregation, traffic fatalities, and greenhouse gas emissions, cities and states must invest in public and active transportation networks. 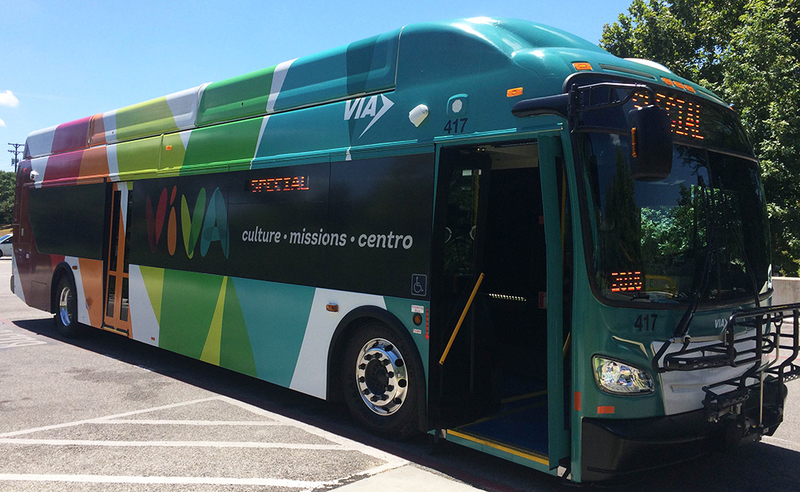 Saldaña got VIA on the City Council’s agenda in 2016 so VIA officials could share its history, funding and operations as the transit agency neared its 40th anniversary of service in 2018. Then-mayor, Ivy Taylor, assembled an Advanced Transportation District (ATD) Ad Hoc Committee, to look into funding options, obtain community input and make recommendations to the council. Saldaña was appointed committee chair. Former District 6 Council Member Ray Lopez was appointed co-chair. Because VIA is primarily funded through the MTA’s half-cent sales tax, the group began by looking into local and state sales tax regulations. In Texas, the state sales tax rate is 6.25% and the maximum local tax rate is 2%, which doesn’t leave cities much room to address local needs, like public transit. North Carolina and Georgia, for example, have lower state sales tax rates (4.75% and 4%, respectively) and allow higher local sales tax rates (2.75% and 4%, respectively). San Antonio’s 2% local tax rate is distributed as follows: 1% to the City of San Antonio; 0.125% to the Edwards Aquifer Protection and Parks Development and Expansion Venue Projects; 0.125% to Pre-K 4 SA Initiative; 0.25% to the Advanced Transportation District (ATD); and 0.5% to VIA Transit. “VIA has done a stellar job with the funds that they’ve been given, but the fact remains that it’s not enough,” Nirenberg wrote in the Rivard Report. Saldaña suggested allocating all the city’s portion of ATD sales tax dollars, which would be around $15-$17 million a year, to VIA. With this bump in revenue, the ATD Ad Hoc Committee relied on VIA’s Vision 2040 plan and VIA’s modeling to impact the largest number of bus riders. The committee considered Prímo service on the five busiest bus routes. Prímo, launched in 2012, is VIA’s first high-frequency, bus rapid transit service. Bus rapid transit offers many similar amenities to light rail at a fraction of the cost. For example, Prímo buses have priority at traffic signals, offer Wi-Fi, and have TV screens with real-time messaging. Prímo stations along route are larger, sheltered, and have digital kiosks with real-time arrival information. Prímo increased in ridership and cut ride times almost in half along one of the busiest corridors in the city, with buses running every 10 minutes between downtown and the South Texas Medical Center. This is the first piece of VIA’s plan to create a system of rapid transit corridors to connect the community to opportunity, support economic vitality and enhance quality of life. Additional options explored by the committee were to increase frequency of each 60-minute-route across the entire service area to 30 minutes and to increase frequency on the systems busiest routes to 12 minutes. However, the Ad Hoc Committee was unable to secure the city’s portion of the ATD revenue because the city planned on using those ATD funds for sidewalks and traffic signals. The city was facing a $1 billion sidewalk gap. Saldaña wanted to find out exactly how city operations and services would be impacted if any ATD funds were transferred to VIA. The committee continued to work with VIA staff and a citizens committee. Phase 1: Increase frequency on seven highly infrequent routes, from 60 to 30 minutes, and increase frequency on two more-frequent routes to 12 minutes. Phase 2: Increase frequency on two routes from 20 to 12 minutes. Phase 3: Increase frequency on two routes from 20 to 12 minutes. “We helped create a plan from both ends of the frequency perspective,” said Arndt. Saldaña said the routes were selected because they were among the most congested in the city. The committee’s three-phase plan would require $10 million over two years from the city for direct operational costs and $14 million in capital costs from VIA for facilities and 29 new buses. Although City Council agreed that VIA needs additional funding, it was a tough time to discuss shifts in funding in Texas, Saldaña said. Public trust regarding transportation was fragile. Council members were concerned about property tax reform bills in the Texas Legislature that could reduce the amount by which local governments could increase their property taxes without a special election. Voters in Harris County had just approved a proposition to continue the dedication of 25% of Houston Metro’s one-cent sales tax through 2025 for street improvement and general mobility projects. Houston Metro still generates more than VIA, 75% of a cent compared to 62.5% of a cent. Moreover, Houston’s sales are far greater than San Antonio’s, thus generating more revenue for the city. On Nov. 10, 2016, then-Mayor Ivy Taylor, and five council members voted against giving ATD funds to VIA. Without the city allocating the ATD funds to improve public transit, the region’s forecasted automobile volume and ensuing congestion would decrease economic productivity, increase emissions of air pollutants, and significantly decrease quality of life for many residents, according to VIA’s Vision 2040 plan, also released in November 2016. Nirenberg asked city staff to look into alternatives, like a permanent set-aside from the City’s General Fund. With the General Election only five months away, public transit became an important campaign issue. In other areas, support for investment in public transit is increasing. For example, in Atlanta, over half of survey respondents (50.9%) said they are willing to pay higher taxes to expand public transit. More millennials, ages 18-34, (59.9%) and even more Latinos (63.9%) said they are willing to pay higher taxes to expand public transit. Meanwhile, VIA continued to improve service and the customer experience. It began converting its fleet to new, compressed natural gas buses; installed 1,000 shelters so that 95% of boardings now take place at a covered stop; launched free, systemwide Wi-Fi and an award-winning mobile app; and is planning new Park & Ride lots, transit centers and Prímo corridors. Four days after the May 2017 General Election, city staff decided funds for VIA should be made from the city’s general fund, which would require annual approval through the traditional budget process. They recommended the item be discussed at the city’s budget goal-setting session in June. So that’s what Saldaña did, with support from the mayor and other council members. “The city of San Antonio deserves public transportation that doesn’t require a 90-minute commute to get to work, the grocery store or church,” said District 3 Councilwoman Rebecca Viagran, according to The Mesquite. The budget process was a big deal in 2017 because the 2018 budget would be the city’s first to use an “equity lens” to allocate resources. Instead of dividing funds equally among the 10 council districts, a needs-based method would allocate more funds to areas with greater need, due to historic housing segregation and inequity. This is important because the city’s allocation of resources impacts the physical world in which we live that, whether intentional or not, determines our opportunities, thus health and life expectancy. Inequity in distribution means some places are more difficult to live in than others, leading to disparities and inequities. “If we’re going to truly say to our community that it shouldn’t matter what side of town you live on, what zip you live on, or what neighborhood you live in, you’re going to have the same opportunity to have good road conditions and functioning sidewalks, this is what it looks like,” Nirenberg said, according to Texas Public Radio news reporter Joey Palacios. Saldaña continued seeking stories to ensure they weren’t ignoring a great segment of the population that had been suffering in silence. In June 2017, he met 63-year-old H-E-B Central Market employee Antonia Mata on the bus. He shared her story and a selfie he took with her on his Facebook. It is his most popular Facebook post. Mata has been riding VIA since she was 17. His fellow council members were now more tuned in to stories about public transit. One council member heard repeatedly about older residents in his district who are dependent on VIA because of disabilities or physical limitations. “Those are the kinds of stories that help make the case for policy change,” Saldaña said. Funding for VIA was included in the proposed 2018 budget presented to Council in August 2017. In September 2017, City Council agreed to invest $4.3 million from its general fund in the FY18 budget to start the frequency improvements with VIA. With the city’s new commitment and continued investments from Bexar County to purchase additional buses, VIA planned to significantly cut wait times on nine VIA routes and along five heavily-traveled corridors by May 2018. In January 2018, VIA began Phase I of their route improvements and increased frequency on 11 routes, which included an additional 53,000 service hours and 12 buses. VIA promoted the service improvements through a rigorous multi-media campaign including bus flyers, farebox cards, new releases, social media and updated pocket schedules. VIA even won first-place for the American Public Transportation Association (APTA) AdWheel award for Best Marketing and Communications Educational Effort for their “VIA Moves Me” video series. This is great news for everyone in San Antonio and will hopefully lead to additional support for future investment and expansion. Meanwhile, Nirenberg and Bexar County Judge Nelson Wolff launched ConnectSA to increase awareness of and advocacy for mass transit planning and solutions in the San Antonio region. In May 2018, VIA began Phase II of its route improvement plan and increased frequency on three routes, which included an additional 11,000 service hours and six buses. Phase II transit improvements impact over 43,000 residents and 52,000 jobs within ¼-mile access of the routes. In August 2018, the proposed FY2019 budget included $10 million to improve weekday frequency, travel and capacity on nine routes and nine corridors. This was approved in September 2018 as part of the city’s $2.8 billion 2019 budget! Many, like Nirenberg, don’t think this is enough. Early Results? Ridership Is Up! It can often take a year or longer to determine progress of improvements to bus routes. Ridership, for example, can be skewed by weather, detours, roadway construction, and major events. Additionally, it can take months or years for news of service improvements to reach residents. Average weekday ridership was down from May 2017 to May 2018 and road construction required VIA to close a major downtown center, further impacting ridership. However, although it was too early to tell, two months after Phase 1 implementation, ridership was up. Ridership increased by 10% on the 11 improved routes from January to July. Just two months prior, ridership on the 11 routes was down 8% between October and December. This is big because Phase I service improvements impact 195,000 residents and 138,000 jobs within ¼ mile of the 11 routes. Phase II service improvements were effective May 7, and by the end of July, ridership on these three routes was up 18%. This is big news because ridership on all other routes was down 8.1% during this time. Combined ridership for Phase I and II routes was up 7% from January to July and 15.1% in July alone. Saldaña continues to hear how these service improvements have made noticeable difference in commute time and how that has given people time back. Phase III will be implemented in January 2019, increasing frequency on two more routes. March 2019 UPDATE: Ridership is up 31% on Phase I routes and 41% on Phased II routes, according to the Rivard Report. March 2019 UPDATE: Watch a video about residents who benefit from increased frequency. March 2019 UPDATE: Of 35 regions analyzed, San Antonio is one of only seven to see increase in transit ridership, according to TransitCenter analysis. City of San Antonio Budget for Fiscal Year 2019 includes $10 million for VIA Metropolitan Transit. Although the VIA/COSA Partnership is a win for both partners, current riders, future riders, and the city, $10 million from the city and $14 million from VIA to improve frequency still may not be enough for a city facing high traffic and pedestrian fatalities, high ozone levels, worrisome congestion, and an additional 1 million residents in the next 20 years. In 2016, 776 people walking were involved in traffic crashes and in 2017, 51 people walking were killed. High ozone levels cause 52 premature deaths per year in San Antonio. In July 2018, the Environmental Protection Agency (EPA) designated the San Antonio area as “nonattainment” for falling short of the federally mandated ozone standards. Congestion costs an auto-dependent city like San Antonio, $14 billion annually in extra fuel consumption and travel time delay, according to the Urban Mobility Scorecard from the Texas Transportation Institute. Texas has dedicated tens of billions of dollars to relieve congestion over the past three decades; yet, congestion has not improved, according to traffic safety advocate Jay Blazek Crossley. In fact, according to two transportation attitude surveys in 2008 and 2018, a majority of residents think congestion has “increased greatly” in San Antonio compared to five years ago. By 2040, travel delay due to congestions is expected to be six times what it was in 2010. In the face of population growth and nonattainment restrictions, improving public bus rapid transit service and frequency requires dedicated lanes or buses will get stuck in worsening congestion with everyone else. San Antonio could also consider light rail or bus rapid transit with dedicated lanes. Tell the state’s Transportation Commission, the regional Transportation Policy Board, COSA Mayor and City Council, and your local and state representatives that you want to see a commitment to and investment in public transit in San Antonio. I am concerned about physical health, economic segregation, air quality, climate change, mental health, and/or economic development and want to see a commitment to and investment in public transit in San Antonio. Read more about Saldaña’s efforts to improve equity in San Antonio. He worked with local partners to start a Learn to Swim program to provide second grade students free water safety lessons. Notice of disclosure: Amanda Merck is a VIA Board of Trustees Member.